There were eight pounds of cherry tomatoes hanging around my counter, meaning it was time to start preserving the bounty. Last year I froze the tomatoes, but this year I wanted to try canning. 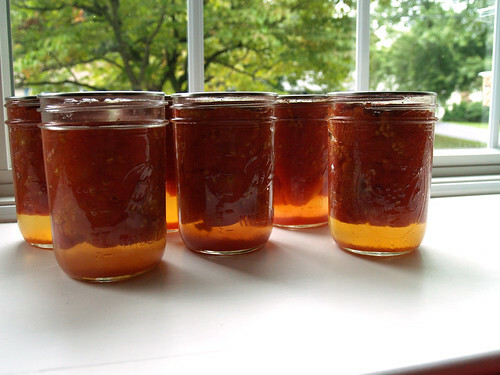 Canning is basic, easy, and versatile. Canning is a precise science. Deviating from a tested recipe and procedure can lead to an unsafe product. Botulism is not cool. If you can follow directions, you can can. Canning takes time. Be prepared to dedicate your day. Buy a real canning rack! Canning makes me feel accomplished, and little like a down-home country girl. I decided to can whole tomatoes. 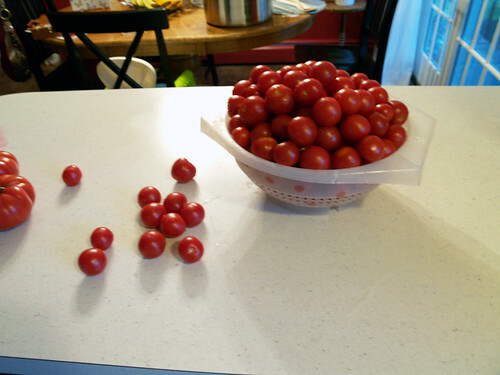 Since I’m overrun with cherry tomatoes, I had no choice but to do the tedious work of blanching and skinning each one. I imagine it’s more repetitive and time-consuming than with large tomatoes. Since this was an experiment and a small batch, I wanted to keep my investment low. Rather than buy a full canning kit, I used my own stock pot, plus an improvised rack for the bottom of the pot (a metal steamer basket). The only items I bought were the wide-mouth jars and a jar lifter. This time of year, canning products are everywhere; I buy mine at Agway. Things would probably have been faster and smoother if I had a rack to lower and lift the jars from the water bath, rather than balancing everything on a metal steamer in the bottom of the pot and picking the jars out one-by-one. Finally, at 1 a.m. I pulled out six lovely pints, each with well-sealed lids. Yay! Thanks for the little tutorial! I am going to can my tomatoes soon too! I never have canned tomatoes before! Eating your own canned tomatoes is the best experience ever. Especially during this never ending CT winter. Great blog!